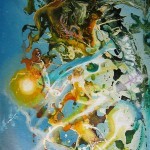 Eternity paintings – two new ones. Here are a couple of new Eternity paintings which have been put in the Small masters works section and Surreal Mixed Media section of this website. I’m working on a large number of these small ones at the moment. This painting is called Embryo and is a mixed media on canvas. This second one is called Amoebic Universe. Embryo involved a great deal of draftsmanship and is very detailed. It is very hallucinogenic. You can see more things in it as you look into it. Figures, objects and faces will pop out at you if you look for long enough. Amoebic Universe is much more painterly. It is also less detailed. Both paintings have been built up with many layers, but those layers are more visible with Amoebic Universe. A large amount of ink was added to Embryo whereas only a small amount is present in Amoebic Universe. These two works are eternity paintings which express different aspects of eternity. What exactly those aspects are is entirely up to the viewer and is bound to change from one viewer to another. 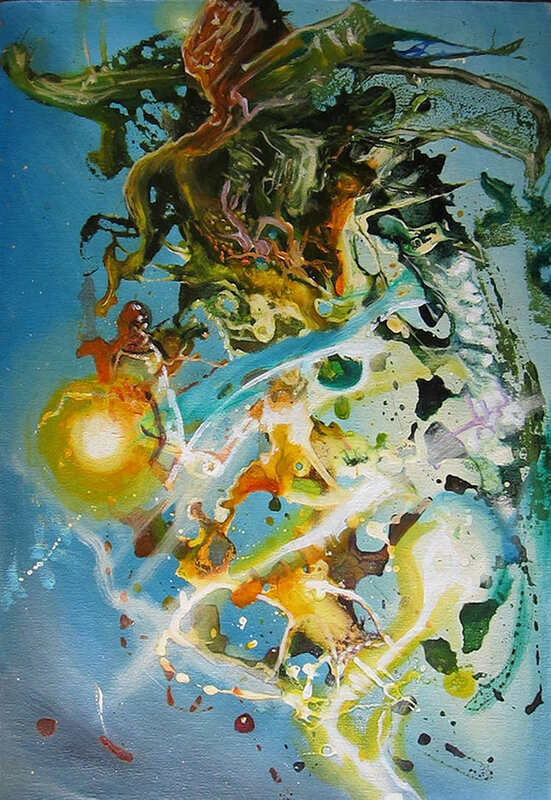 All of my eternity paintings are meant to evoke some sort of idea or feeling surrounding the concept of eternity. However, the means, approaches and techniques used to create the imagery vary greatly in these works. The titles are generally poetic. They suggest rather than dictate possible meanings in these works. This entry was posted in Uncategorized on September 17, 2014 by Lenny.